Q:How to merge several pdf files into one flash book? Convert several pdf documents one by one is a waste of time. We need to merge homologous series of magazines into one sometimes. How to make it? Is it possible to transfer pdf to magazine in such a convenient way? PDF to FlashBook Lite provides two conversion modes for you to choose from. They are “Convert to Flash” and “Batch Convert”. You can transfer your books one by one with the first mode and convert in batch with the second mode. Step1: design a theme for your book and click Batch Convert to enter the converting window. Step2: add PDF documents, choose the output style. 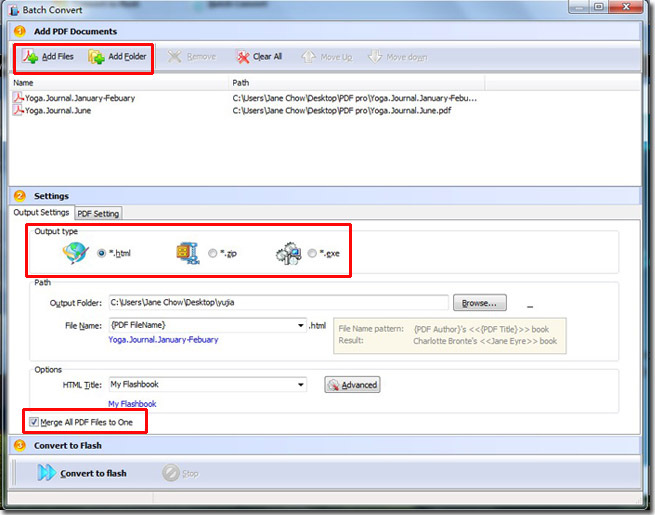 Then check the “Merge to All PDF Files to One” option as below. Your books will be merged to one.